Computing is undergoing a shift from client/server to the cloud, a shift similar in importance and impact to the transition from mainframe to client/server. Speculation abounds on how this new era will evolve in the coming years, and IT leaders have a critical need for a clear vision of where the industry is heading. This white paper from Microsoft discusses the underlying economics driving this long-term trend. 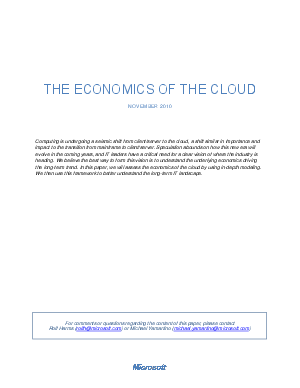 The economics of the cloud, using in-depth modeling, is also reviewed to better understand the long-term IT landscape.